Robert Steibel has a great post inaugurating a blog which will apparently be all about Jack Kirby. There’s a little too much for my taste about the man himself, but he really gets rolling when he analyzes a page of The Mighty Thor #147. What we’re looking at here: this is a rare look at Kirby’s actual pencils… and his writing. 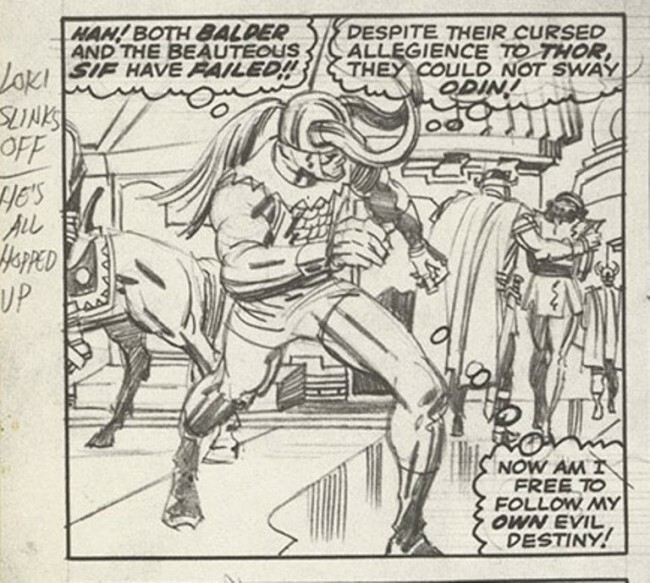 He and Stan Lee would discuss the book, then Kirby would plot, draw, and essentially write it– the marginal notes on the left are his hints to Lee on what’s happening in the panel. Lee then wrote the florid text to fit what Kirby had already done. The inking is faithful, but loses a certain appealing sketchy quality to the pencils. (We also, as Steibel points out, lose the little dude to the right of Sif.) 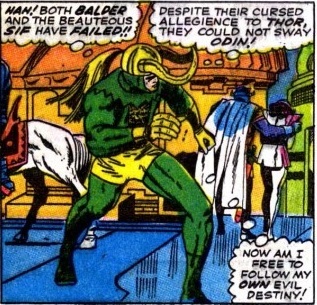 The coloring is pretty awful… what is going on with Balder’s cape? Steibel gives Stan Lee a pretty hard time, but it’s unfair to compare Kirby’s informal notes with Lee’s finished prose. Still, the method probably inevitably resulted in overdoing the prose… Stan was not someone to let the art speak for itself. Schuiten….). But he’s kind of the Saints Row of comics: his stuff is big dumb fun– huge muscled heroes and villains, outrageous situations, over-the-top theatricality, absurd and inscrutable machinery, but always fun and accessible. It takes an assured artist to just throw in a horse in the background because he felt like it, to say nothing of the architectural elements… they don’t make any sense really, but they don’t need to– they’re supposed to be an otherworldly realm anyway.